More horse influence on my art-quilting! We had such a lovely pre-Christmas lunch with friends who own horses for joy, I just sent this postcard in the mail today. Thanking them not only for a delicious lunch, great hospitality, but also a donation from their horse’s mane and tail. Back home this hair was laundered with great care, and it looked so lovely and pure white – in fact, good enough to feature on my postcard to them. Quite a stroke of luck it was – watching the horse being brushed for a ride, when thoughts stirred within me …. of creating an art-quilt which incorporates horses hair. I say had to blurt out – may I have that? I did get a few quizzical looks. This postcard was the ideal way to trial my idea – and I must say, the result is very pleasing. It was a great way too, to express our thanks to our delightful hosts. They are one of a kind too. With the closure of 2009, we all are welcomed with a brand new beginning…..and my wish is that new doors be opened. The essence of this sentiment is shown by my photo of this adorable building situated within Sturt College at Mittatong NSW. I think it suitably reflects my need for new doors open to nourish creativity and strong artistic growth. Dont you love the way this door throws open an invitation? To what, you may ask, well I will let you find your own answer. In my mind, this door beckons entry to new directions – some are scarey (being new) – they will lead to stronger artistic talent and capacity. Well that’s what I want…maybe this should form part of my New Year’s resolutions. Whoever you are, where ever you are, I send best wishes for a relaxing break over Christmas and a safe and happy new start to the wonderful year 2010. The finale!! 14.12.0 ended with a dash of extra creativity – sunpainting! White cotton fabric was applied with watered down sunpaints. Ferns from the courtyard with a few rocks to prevent the early evening breeze blowing all this work away. This morning this little piece emerged. The image is subtle, caused by the subdued light at the end of the day. But you know what, I think I like the subtle effect. I’d like to know if you have experienced sunpainting and what you found worked best for you! Hey, its time for fun! My dear ♥ “man of the house” ♥ had been suggesting for a long time, something that I only recently believed would be feasible. Moving my studio from the smallest to the largest room in the house! This time around (from his suggesting) in my mind it all seemed to make sense, i.e. to relocate everything in the lounge, dining, and guest rooms would be OK – but would you know it…… it was better than that! 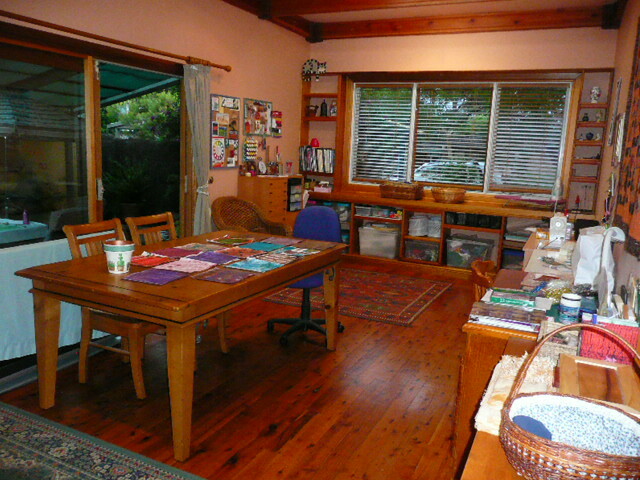 It is FANTASTIC having space for my creative spirit! 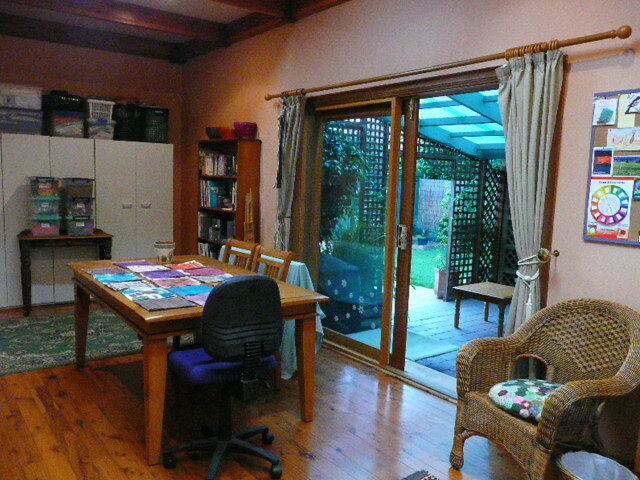 More than that…..all the other rooms work much much better now and more harmoniously within the new arrangement. Here you will see my long-time friend Jenn during her visit here yesterday Monday 14.12.09, having a P & P day. Paints, paper, and of course the associated big mess – just look what wonderful images were created. Jenn is a whiz with new techniques – we shared so much …. the new books we both received as “early Xmas presents”, and then poured out all the ideas that would transfer onto paper. We were thrilled with our productions – Jenn taught me a new technique using credit cards! Now that’s a mystery, isnt it? Want to know more? 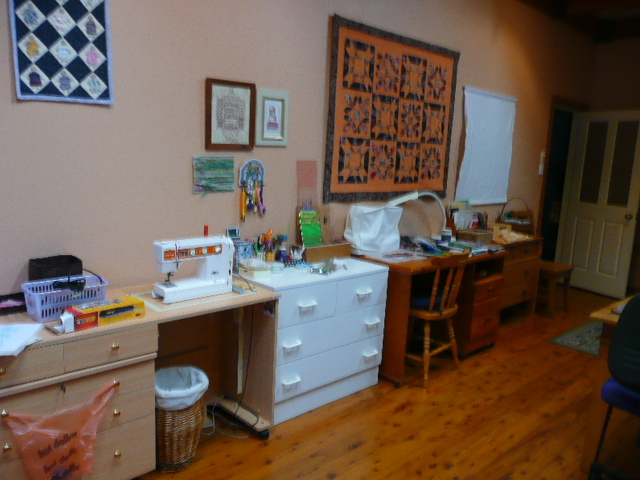 You are currently browsing the Crafty Quilting with Pamela blog archives for December, 2009.